We finally gave up and went to bed at 2am, a full 36 hours after typhoon Haiyan/Yolanda barreled through the Leyte Gulf — and still not a word of the situation in Eastern Samar, Rena’s home province, where the typhoon first made landfall. This morning, up again at 6:30 to find that on some discussion boards there has now been a report of sixteen deaths in Lawaan, which is the municipality that includes Guinob-an, Rena’s home town. Meanwhile the big picture is starting to become slightly more clear. Hardest hit is Tacloban, the provincial capital of Leyte, which is 54 miles from Lawaan, a city of 200,000 where more than 1,000 are dead. Because of its configuration Tacloban appears to have gotten the worst of a massive tidal surge. The bottom line on what we know, or think we know, at this point is that they are acknowledging 1,000 dead in Tacloban, 200 dead in Samar — and there is a story circulating among the Samar community that there are 16 dead in Lawaan, the small municipality that includes Guinob-an, Rena’s home town. 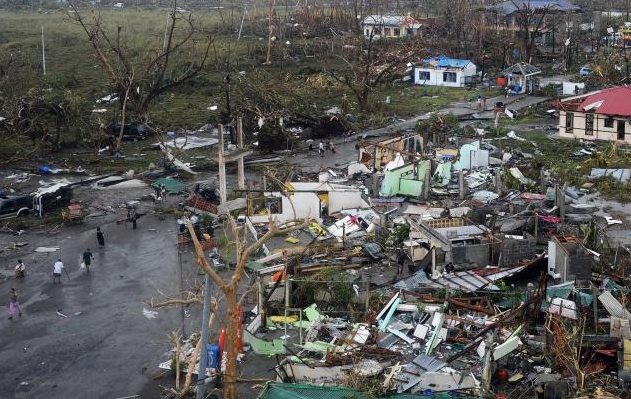 There is no electricity and no cell phone coverage anywhere in Samar yet. Smart Communications, the main cellular company there, has teams working and hopes to have coverage restored in 2-3 days. News teams have been focused more on Tacloban and so there is not much in the way of news reports about Samar even though it was the first point of landfall. Here is an aerial picture that we had to stare at for half a minute to be sure it’s not a picture of Rena’s hometown and her house (the house in the upper eft hand corner) …. turns out it is from Iloilo but if you’re imagining Rena’s home town, as we are, this is very close to what it’s likely to be like. But of course it’s just speculation — still no real news. One resident, Sandy Torotoro, told Associated Press he was swept away when his house was ripped from its moorings. “When we were being swept by the water, many people were floating and raising their hands and yelling for help. But what can we do? We also needed to be helped,” he said. The airport has been badly damaged and only military flights are able to operate, the BBC’s Jon Donnison reports from Manila. 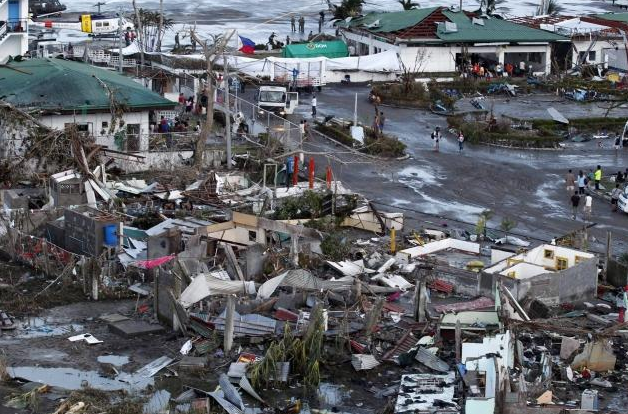 John Andrews, deputy head of the Civil Aviation Authority, said he had been told of more than 100 bodies around Tacloban airport, with at least 100 more people injured. Local TV journalists said they had seen 20 bodies in a church in Palo, 10km (six miles) south of Tacloban. Palo, ironically, is where General Douglas MacArthur famously waded ashore in the Leyte Landings in World War II. Here is a New York Times compilation of eyewitness reports. Here is a good summary of what is known as of Saturday morning in the US. 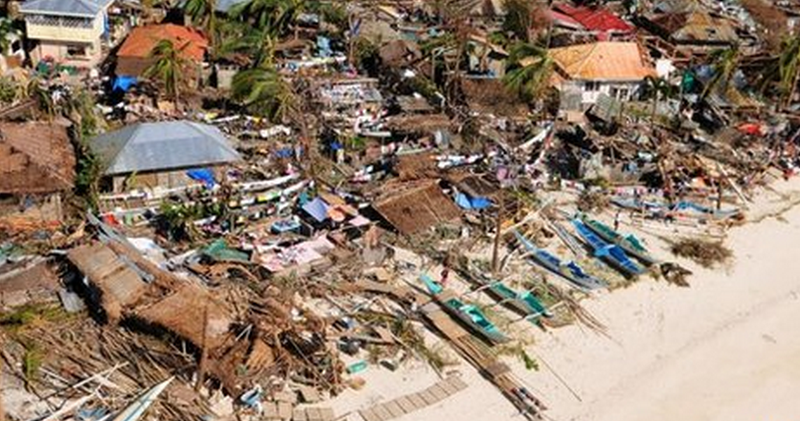 Philippine Typhoon Leaves 1,000 Dead in One Coastal Town Alone. 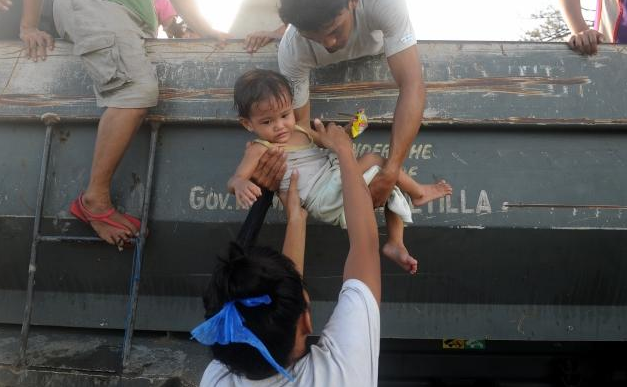 Here is an article with the most comprehensive and compelling pictures I’ve yet seen: At Least 1,200 Dead from Typhoon Haiyan — and here are a couple of selected pictures from that article.